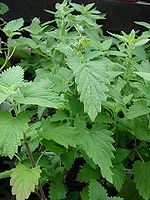 Catnip are a number of species of perennial herbs belonging to the taxonomic genus Nepeta from the family Lamiaceae (the mint family). There are four species in the genus Nepeta. As implied from the name, Catnip has something to do with cats. Cats are very attracted to this plant because it releases a fragrant chemical into the air when bruised. The chemical is like a drug to them. When they smell the plant, they cannot function properly. The cats will roll in the plant if near enough. If the plant is not bruised, cats will not come because the attractive chemical has not been released. To prevent Catnips' from being destroyed, they should be fenced from a young age. There are many uses for this plant which mainly include medicinal purposes. It is known for its soothing oils. Catnip is characterized by its small, white, purple, pink, or blue flowers. The flowers are clumped together at the top of the plant. The plant itself can grow up to 3 feet tall by 3 feet wide. 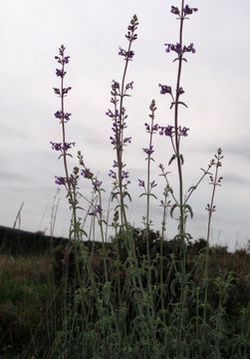 Catnip is common, especially in North America. It looks like an average plant that doesn't have anything really to stand out. One might even mistake it for a weed. These plants have known to be to scented which attract cats. It has a minty fragrance. Catnip produces Nepetalactone, which is a chemical that allures a cat by its smell. The chemical affects many cats' brains. The plant is covered with green leaves and looks like a shrub. The leaves of the plant resemble mint leaves. They have square shaped, stems with blades of leaves that have pointed edges. The stems are straight and erect. Each leaf has soft, short hairs on it, especially located underneath the leaf. Catnip can be found almost everywhere but it originated in Europe. From that point on it spread across the world. They are a common plant and appear to be self-growing. It can grow in almost any condition or soil. The affects of Catnip on cats. ↑ What is Catnip? fabcats. Web. Accessed on May 23, 2012 Unknown Author. ↑ Beaulieu, David. Catnip Plants or Catmint (Nepeta Cataria) About.com. Web. Accessed on May 9, 2012. ↑ Brown, Ellen. 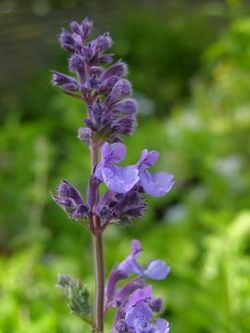 Growing: Catnip (Catmint) ThriftyFun. Web. Published on March 23, 2012. ↑ Brown, Ellen. Growing: Catnip (Catnip) ThriftyFun. Web. Published on March 23, 2012. ↑ Bergeron, Karen. Catnip Alternative Nature Online Herbal. Web. Accessed on May 9, 2012.